See? I told you I had a treat for you, didn’t I? 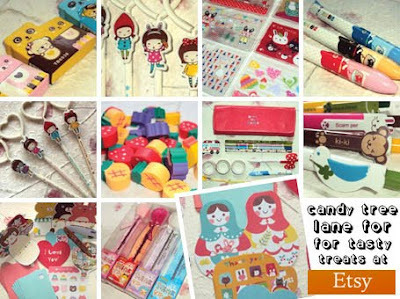 Candy Tree Lane is an Etsy shop that sells absolutely adorable kawaii stationery and goodies. But that’s not all, because it turns out they’ve also got their own blog too - packed to the rafters with all sorts of kawaii gifts and goodies for you all to enjoy! And, as if that wasn’t enough for you lucky readers, they’ve even got their own Facebook page too! Three treats for the price of one! Not bad, eh? Cute Classics! The Mr. Men! Marvellous Mayhem at Monster Zoo!